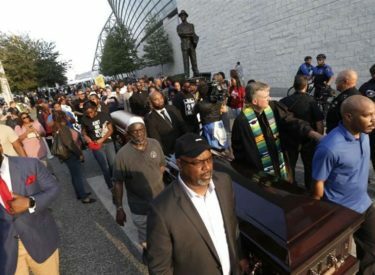 ARLINGTON, Texas (AP) – Demonstrators, including some who rolled empty coffins, marched outside AT&T Stadium ahead of Sunday’s Dallas Cowboys game to protest recent fatal police shootings. Attorney Lee Merritt, who represents the family of Botham Jean, says protesters are demanding that Dallas police officer Amber Guyger be fired and charged with murder instead of manslaughter for Jean’s death. Guyger, who is white, shot the 26-year-old Jean, who was black and her neighbor, on Sept. 6 at his apartment.